Happy late summer everyone! I honestly cannot believe that I am saying that already. Does it seem like summer flew by extra fast this year to anyone else?? Oh, and I never intended to take over a month and a half off from blogging. But I just got so busy having so much fun with the kids that all the sudden, blogging took a back seat to everything else in life so anyway, I’m back!! And my hubby Erik has been grilling all summer long. Here is a great flavorful dish that he whips up on the grill a lot during these great summer months. 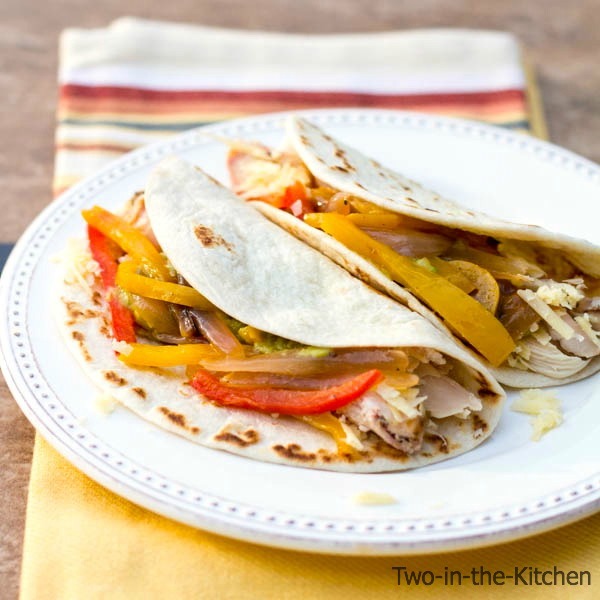 These Grilled Chicken Fajitas are flavorful and satisfying. 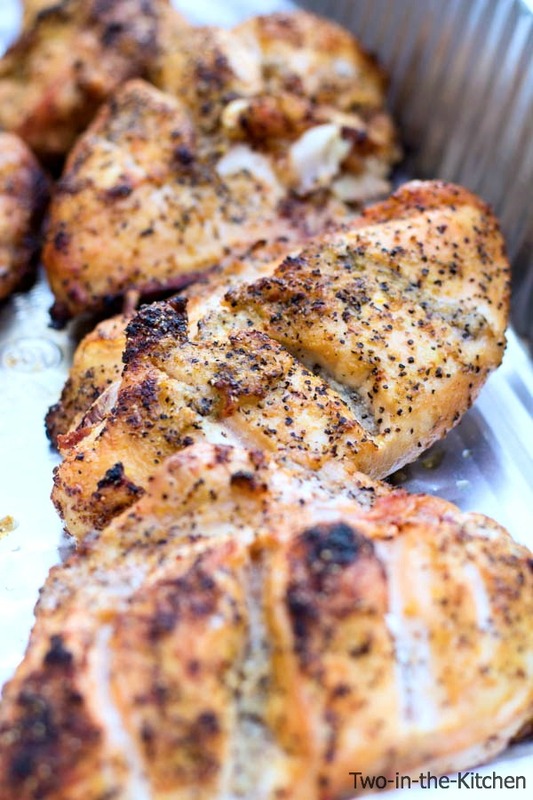 In fact, whenever my husband grills chicken, people always rave about how juicy and flavorful his chicken is. And he always says that the problem with the way many people grill chicken, is that they grill it too long because they worry that it isn’t cooked through. But when you over cook chicken, it dries out and loses its juiciness. Cut slits across the split breasts on the diagonal. Squeeze 2-3 lemons all over the chicken, drizzle with olive oil and season with lemon pepper and garlic salt. 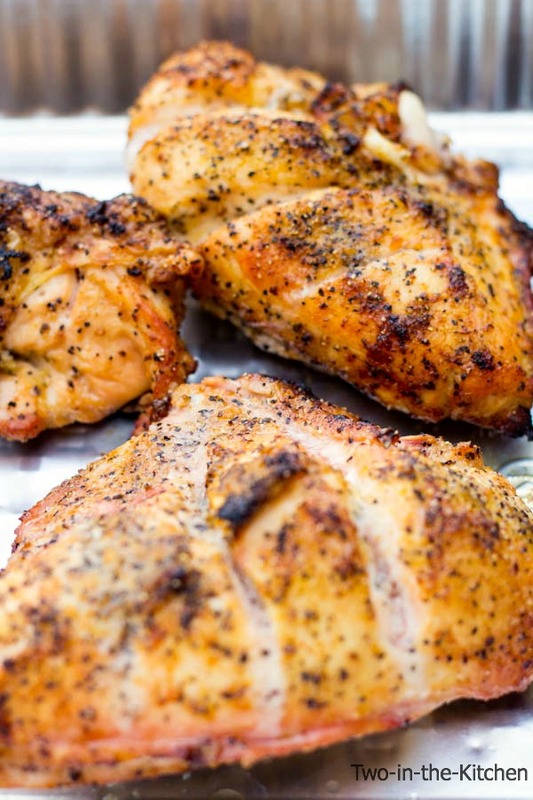 Grill the chicken on indirect medium heat until the internal temperature reaches 165 degrees. Approximately 25-30 minutes. Remove the chicken from the grill, cover and allow the chicken to rest for 15 minutes. 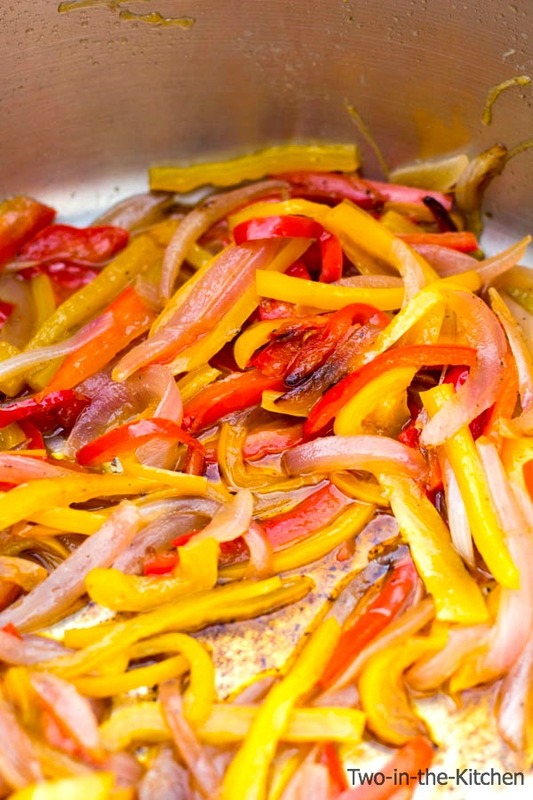 Take 2 red peppers, 2 yellow peppers,and 1 red onion and slice them into 1/2 inch ribbons. Sautée them in olive oil, and cracked pepper and kosher salt, in a big pot over medium heat, until the onions are translucent and peppers soften and begin to caramelize Approximately 20 minutes. Heat up the tortillas, shred the chicken and serve the fajitas with guacamole if desired. Try some of these related recipes! Welcome back! Sometimes it is so good to take a break. Kids are only young once and you have to enjoy every moment. I’m glad you had a good summer. These fajitas look delicious! I need to try these. I am really like the lemon and pepper seasoning. Thank you Cindy. I SO appreciate all your support!!!! Welcome back, Renee. I love fajitas in the summertime, these would be perfect for our final summer bbq. I am new to your site and I can’t wait to look at all your recipes! Seriously Marcie!! For those who don’t realize it, blogging is very time consuming and sometimes you just need a break!! But it is good to be back!! 🙂 Fajitas in the summer are the best aren’t they!! I just love fajitas! These look so good! 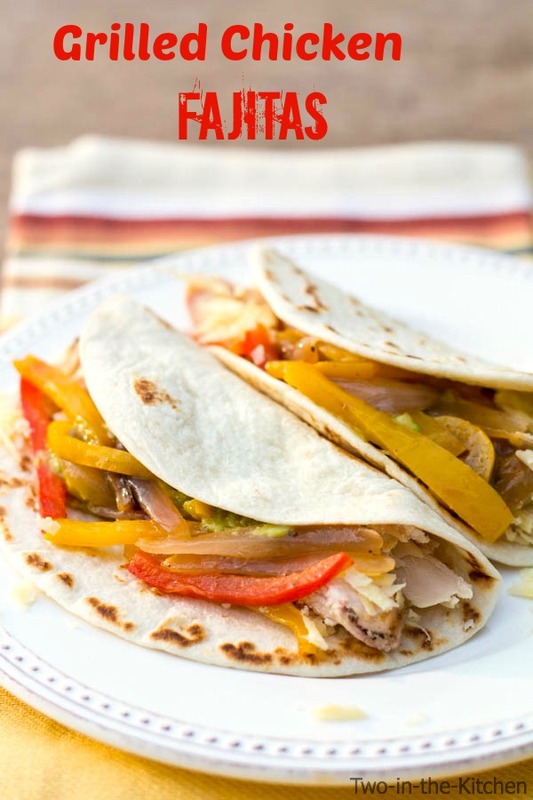 Love chicken fajitas- ultimate comfort dish! Loving the fact these are grilled- so, so good! The summer did go by extremely fast but there’s definitely still time to do plenty of grilling. These fajitas look amazing! Great weeknight meal! Welcome back :o)!! Grilled chicken fajitas are one of my FAVORITE dinners everrr. Your Chicken fajitas looks amazing! We love chicken and steak fajitas and grill them a lot. Nothing better than cooking on the grill! I linked over from another site to your site and I am glad I did, lots of great recipes and pictures too! check out my site and Blog sometime! Welcome back! I cannot believe summer is winding down either – time is a flying! And agreed – we love grilling in the fall (so much cooler out!) – these sound delicious! Great recipes- can’t wait to try! Pinned it and started following on Google +. Found your blog on the Show Stopper Sat. link party. Loving how you brought this gorgeous and delicious recipe over to the link party this week, pinning! These chicken fajitas look incredible and full of flavour! 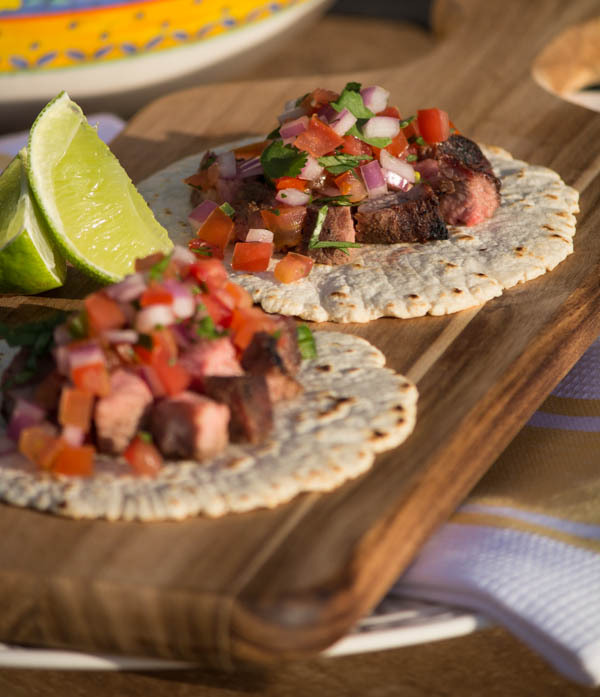 I like to make Mexican a couple of times a week so I have no doubt that I will be recreating your yummy fajita’s… thanks for sharing the recipe! I’m like that too Thalia about eating Mexican a lot. It is definitely one of my favorite foods!